It was delivery day at Brookwood Elementary School and the students in Shannon Cole’s class knew it. “I’m so excited!” exclaimed Dodger Nitti, who was waiting for the visitors to arrive. 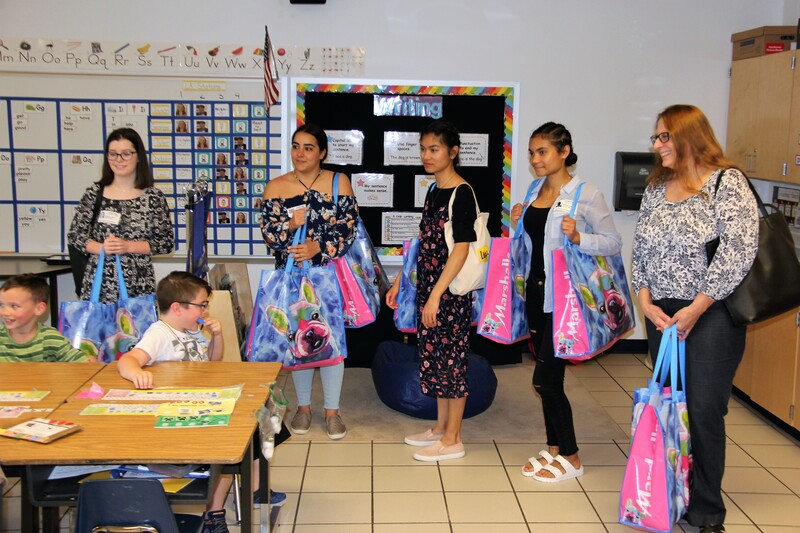 Nitti and his classmates had not seen their new friends from Tallwood High School in more than two months, but today was the day the design class students would return with special handmade gifts for everyone. Moments later, the classroom door opened and their special guests walked in carrying colorful bags. “There they are!” exclaimed one student. “Do you have blankets?” asked a third student. They did. And judging by the smiles on everyone’s faces, it was worth the wait. The blankets, personalized for each student with fabric featuring a favorite item or interest and with his name on a pocket, were custom made for another purpose. The special design of the blankets – created with weighted balls that are evenly distributed among quilt-like squares stitched throughout the fabric – also means they are not cheap. Ranging from $90 to $150 each, according to Cole, it is cost prohibitive for some families to purchase blankets to have at home. 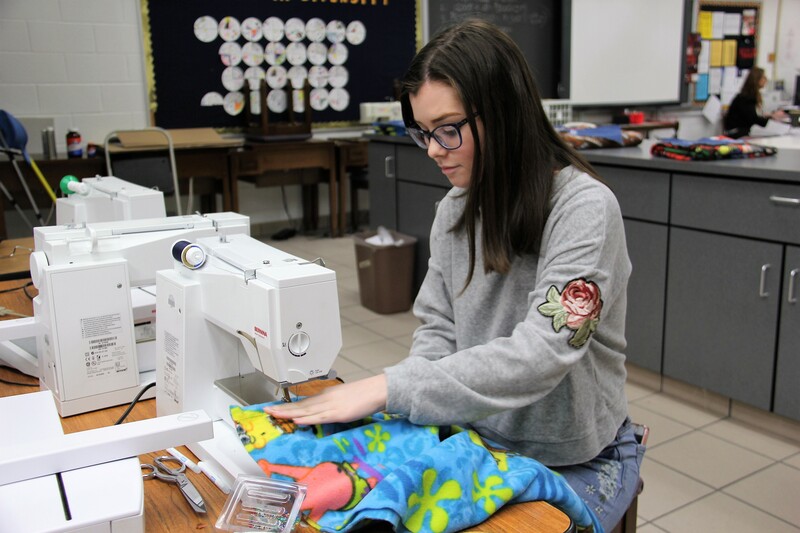 This was one of the reasons Cynthia Chadwick wanted her high school design students to create weighted blankets last school year. 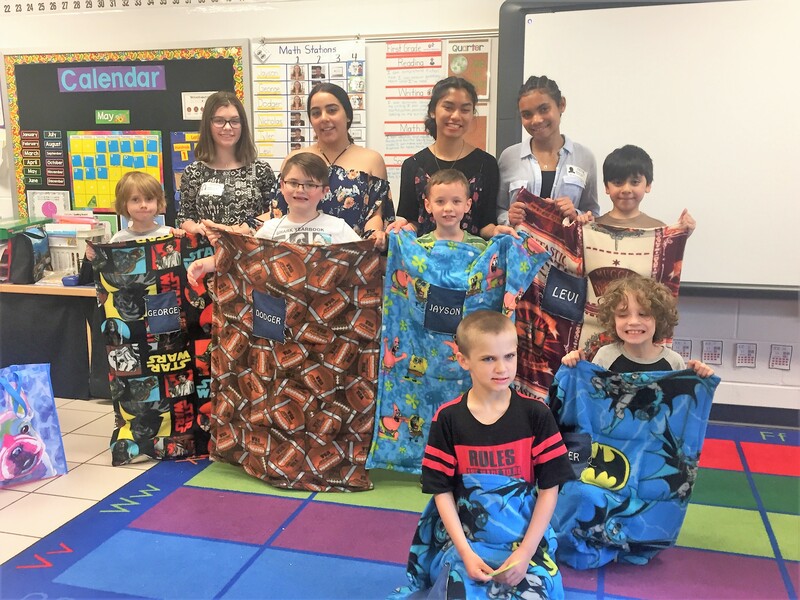 When the Tallwood teacher was not able to obtain grant funding to make the blankets, she temporarily shelved the idea. A personal connection to a child with autism and wanting her second- and third-year design students to complete a unique, higher-level project caused her to reconsider the idea this year. As it turns out, Cole’s daughter Abbey Cole is a Design III student in Chadwick’s class. Chadwick’s excitement, however, was no match for that of the Brookwood students. “It’s footballs. My name!” exclaimed Nitti, whose blanket was made to honor his beloved team, the New England Patriots. “It’s SpongeBob. I love SpongeBob,” Jayson Gossman repeated as he walked throughout the room clutching his blanket. “This is SO cool! Batman!” said Tyler Perez, wearing a T-shirt featuring the superhero. And for as much as Perez loved his Batman blanket, he was equally fascinated by the green, heart-shaped note he found in the pocket. 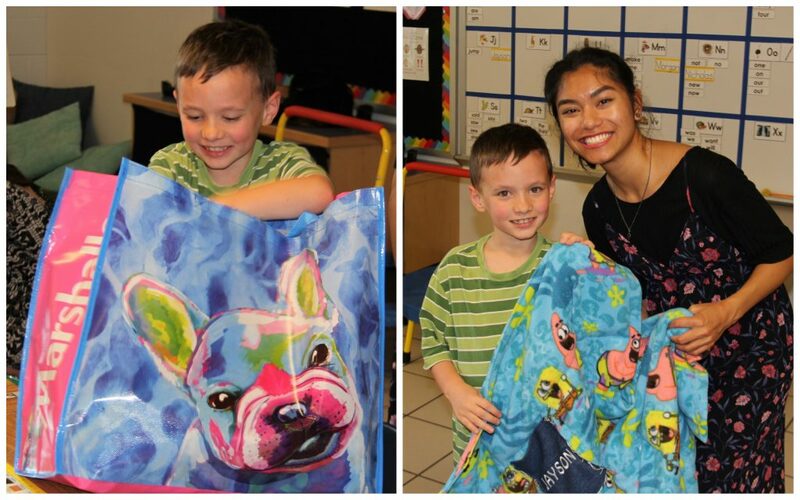 Each student received a personal note in the pocket of his blanket. 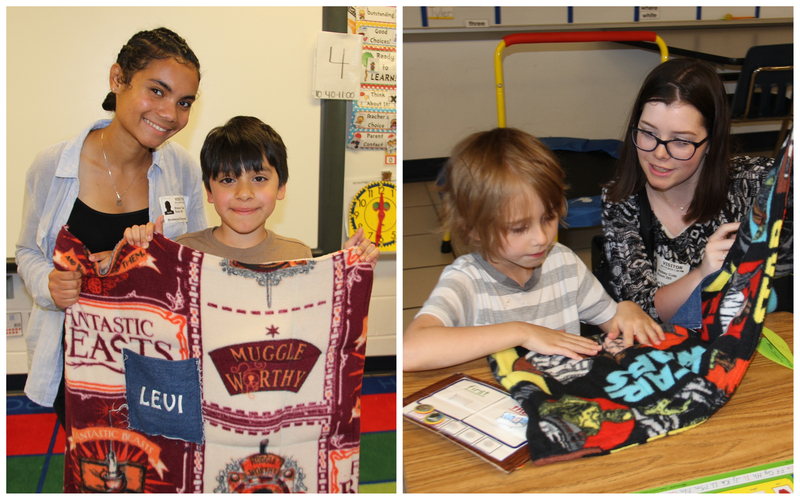 Levi Angulo loved his blanket featuring Harry Potter, his favorite character who has “a scar and a wand.” George Galeota and Nicholas Harakal saw their favorite characters on blanket fabric with scenes from Star Wars. For the Tallwood design students, delivery day was meant with equal parts excitement and relief. She did and Nitti couldn’t be happier. Her design classmate, senior Briana Traut, agreed. “I’m just really happy to see that they love them so much, and it was just a really great experience to be able to do something that would have a positive impact. I know they really appreciate it,” Traut said. Abbey Cole appreciates that her design class has given her the opportunity to support others. The connections between the elementary and high school students are the most memorable aspect for Shannon Cole. 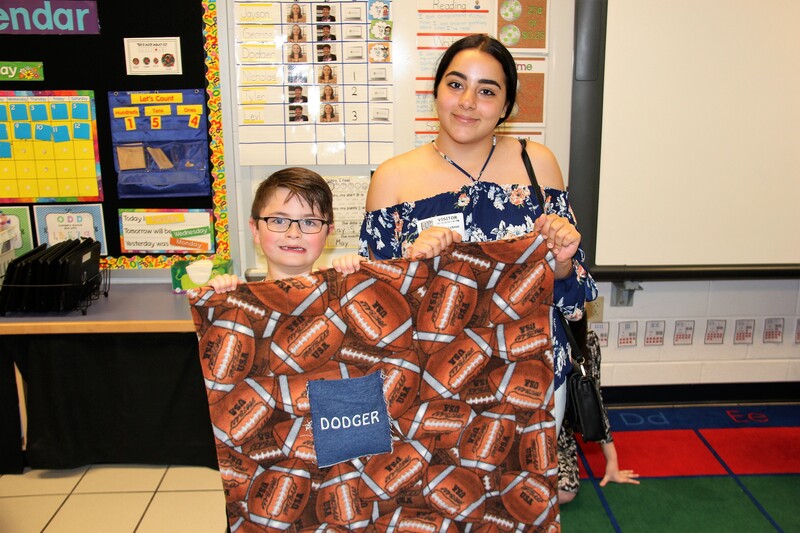 “Personally, I feel like the most beautiful part of this project was the relationships that were built, and the time that they took to come in and get to know the students and who they are so that they could really personalize each blanket,” reflected Cole. 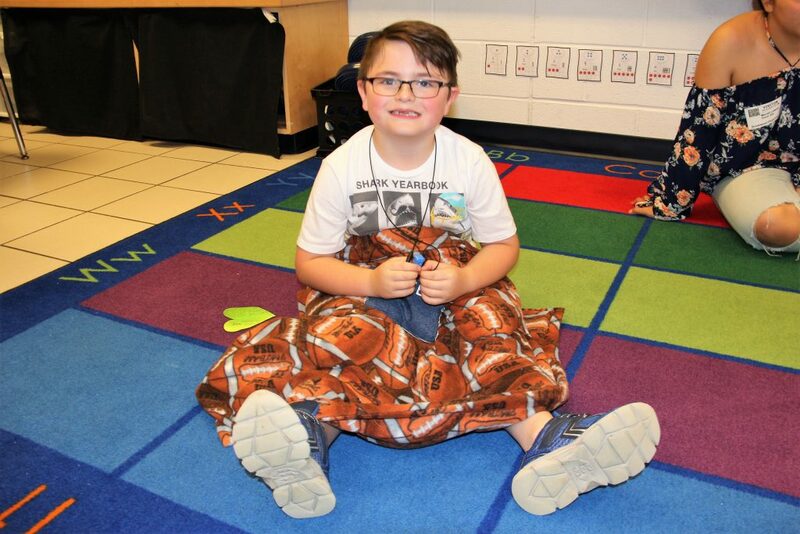 Carrying his personalized blanket and talking about New England Patriots quarterback Tom Brady, Nitti was asked what his favorite player would think about the football blanket. An amazing teacher and amazing students. I am so proud of all of them! What an incredible opportunity for these highschool students to create and give a gift that will have a significant impact on a child. They will never forget your kindness. We are so blessed, Dodger is our Grandson. We are in tears over this. Can we help in any way?? A great show of where a teacher’s heart is at…where there is a will there is a way! Amazing job to the teachers and students. You are ALL an inspiration! Amazing! It’s always a good thing to teach kids about helping others! Everyone can make a difference in someone’s life! Kudo’s to the kids and teachers. Thank you. Excellent work here, students and teachers. You did well. This is such a great story ….yay dodger for getting your blanket with footballs !! !